AssetTagger is a new Smart Central acquisition application that provides the user options for creating, editing, and managing both metadata and file structure of digital media content. AssetTagger can be accessed through the web from any network accessible computer and is driven by Smart Central and is a cloud application running on your private server. You can access primary on-air applications within the automation system through a web-based portal. AssetTagger and can be launched as an application to ingest content from digital file sources or tape, time a show, “tag & bag” syndicated promos, view and approve content. In AssetTagger you can also edit database information. When a television station is running a syndicated program, the show will send the stations raw promos that each station must edit local video graphics and an audio over for each promos sent. One 30 second raw promo from the show must be edited 3 times: One with a graphic that will say something like, “Tuesdays at 4pm”; Then the next version will say “Tomorrow at 4pm”; Then another to say, “Coming up Next”. One promo must be edited three different ways for a station to run it on the air. That work is being done for each promo by each station every day. There are hundreds of these promos each day. A television station will spend between 10 to 40 hours a week editing syndicated promos. Once the Editor is finished with the produced promos then they must be ingested in Master Control. This is a very labor intensive process. To help streamline this process we created AssetTagger, which gives the station the ability to mark the virtual SOM for the video and audio layers. This allows Acuitas to play back that raw promo several different ways. It automatically tags the promo during playout. Depending on how the raw promo is scheduled we can play it out to show “Tuesdays at 4pm”, or “Tomorrow at 4pm”, or “Coming up Next”. This greatly reduces the labor time for syndicated promos. Lastly, if every station in the group has Acuitas then we can use the same promo to play out for each local station with localized graphics by handling the content once. Huge time and cost savings. AssetTagger is set to replace Florical’s legacy acquisition products such as MediaFiler, MediaTimer, and InventoryBrowser over the next couple of years. AssetTagger is the automated “tag & bag” method in the Florical Acuitas server. Experience the new automated workflow for managing “tag & bag” for syndicated promos within the Acuitas channel-in-a-box server. 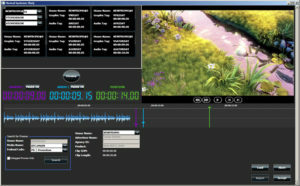 The user can ingest the “raw” promo and then mark the “in” point for the video and audio tags and then AssetTagger will generate multiple copies of the syndicated promo for playout. This feature will reduce the need for departmental involvement in the “tag & bag” process; saving both time and money. Dell /Intel Core 2 server class computer with Microsoft Windows: Windows 2003 SP2, 3.0GHz CPU, 4 GB RAM, 160GB HD X2, RAID1. Supervisory Monitor – monitor multiple channels from one workstation and directly select any single channel to access for control. Supervisory Monitor comes in two modes: duration based or event based.